Whether it’s a gift for someone close or an item that needs a touch of enhancement, satin ribbons are perfect to fill that essential part. The glossy finish and bright colors such as red, blue, white and other colors provide you with an opportunity to pull out your creativeness for any event. 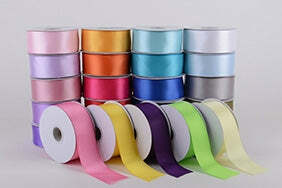 Even if it’s a wedding decor or you want your crafts items and invitations to be unique, or you need to add an innovative persona to fashion accessories, BB Crafts exclusive collection of satin ribbons is a perfect platform to choose from. Go for polka dot to create a vintage flair in any decoration or with the animal print you can add a contemporary twist to any piece. For that luxurious touch, you can beautify the appearance with gold edge ribbons. From sophisticated designs to the modern pattern, you can dive through the variety and shop as many pieces as you want. We assured you of your impressive experience with us!